This is a very simple crochet pattern that can be finished while watching one movie. I’m using US crochet terminology. 0-3 months (3-6months, 6-12 months, 1-2 years, pre-schooler). Finished measurements – circumference 34 (40, 44, 48) cm, depth 11 (12, 13, 15) cm. Please note, that if you use thicker cotton, or other fibers that are stretchier than cotton, you may not get the same size! 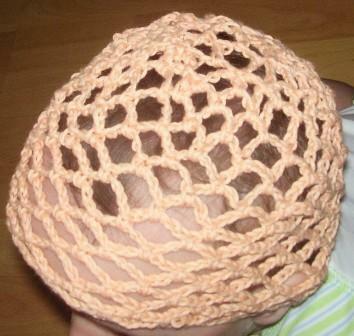 The hat is crocheted in rounds bottom up. Some people find that they get better results if they use a larger hook for the foundation chain. I’d recommend it especially if you use a thicker yarn and 4.0mm/G hook for the body. At the beginning of each round you need to “climb up” the side of an arch using slip stitches, so that the arches begin from the top of the arches of the previous rounds. You can use a stitch marker to mark the beginning of the rounds. Ch 60 (64, 68, 72, 80) link by sl st in circle. Round 1 – *Ch5, sk3, sc** till end, instead of last sc, make a sl st in sl st that linked the initial chain into circle. 15 (16, 17,18, 20)arches. Rounds 2-9 (2-10, 2-11, 2-12, 2-14) – Sl st into next 2 chains, sc in next ch, *ch 5, sc in the next arch** till the end, for the last arch, do sl st in the same ch as the first sc of this round. Round 10 (11, 12, 13, 15 ) – sl st into next 2 ch, sc in next ch, *ch 4, sc in the next arch** till the end, for the last arch, do sl st in the same ch as the first sc of this round. Round 11 (12, 13, 14, 16 ) – sl st into next ch, sc in the same arch, *ch 3, sc in the next arch** till the end, for the last arch, do sl st in the same ch as the first sc of this round. Round 12(13, 14, 15, 17-18) – for all sizes, you should end up with 12 arches after this round(s). You will be decreasing whole arches by skipping doing chains and making a slip stitch into the next arch straight after the sc. The decreases are spread evenly across the rounds. For size 0-3 months -sl st into next ch , sc in next ch, ch 3, sc in the next arch, sl st in next arch. *[ch 3, sc in the next arch] , repeat from [ to ] 3 more times ,sl st in next arch** , repeat from * to ** till the end, for the last arch, do sl st in the same ch as the first sc of this round. For size 3-6 months -sl st into next ch , sc in next ch, ch 3, sc in the next arch, sl st in next arch. *[ch 3, sc in the next arch] , repeat from [ to ] 2 more times ,sl st in next arch** , repeat from * to ** till the end, for the last arch, do sl st in the same ch as the first sc of this round. For size 6-12 months -sl st into next ch , sc in next ch, *[ch 3, sc in the next arch], repeat from [ to ] 2 more times, sl st in next arch**, repeat from * to ** once more, *[ch 3, sc in the next arch] , repeat from [ to ] 3 more times, sl st in next arch** , repeat from * to ** two more times, for the last arch, do sl st in the same ch as the first sc of this round. For size 1-2 years -sl st into next ch , sc in next ch, ch 3, sc in the next arch, sl st in next arch. *ch 3, sc in the next arch, ch 3, sc in the next arch, sl st in next arch* till the end, for the last arch, do sl st in the same ch as the first sc of this round. For pre-schooler – you have to do two rounds instead of one for this step. Round 17 – sl st into next ch, sc in next ch, ch 3, sc in the next arch, sl st in the next arch, *ch 3, sc in the next arch** – 9 times ,sl st in next arch ; *ch 3, sc in the next arch** until the end of round, for the last arch, do sl st in the same ch as the first sc of this round (18 arches). Round 18 – sl st into next ch , sc in next ch, ch 3, sc in the next arch, sl st in next arch. *ch 3, sc in the next arch, ch 3, sc in the next arch, sl st in next arch* till the end, for the last arch, do sl st in the same ch as the first sc of this round. Round 14(15, 16, 17, 20)– sl st in the next two, ch 4, (dc in next arch, ch1) till end, sl st in the 3rd chain of the first 4 stitches . If your gauge is looser, and you end up with a larger hole at the top of the hat after the last round, you may do another round with dc’s only, no ch1 in between. ©Leyla Alieva 2010. You may use the pattern to knit items for any purpose if the designer is credited. You may not publish this design or any part of it without the consent of the author. www.silkandwool. 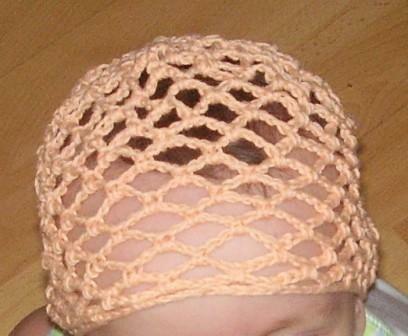 Separator image Posted in Crochet Patterns, My Knitting and Crochet Patterns and tagged with baby hat, crochet, fishnet, pattern.